A distinct feature of a voyaging canoe is the two navigator's platforms in the stern. 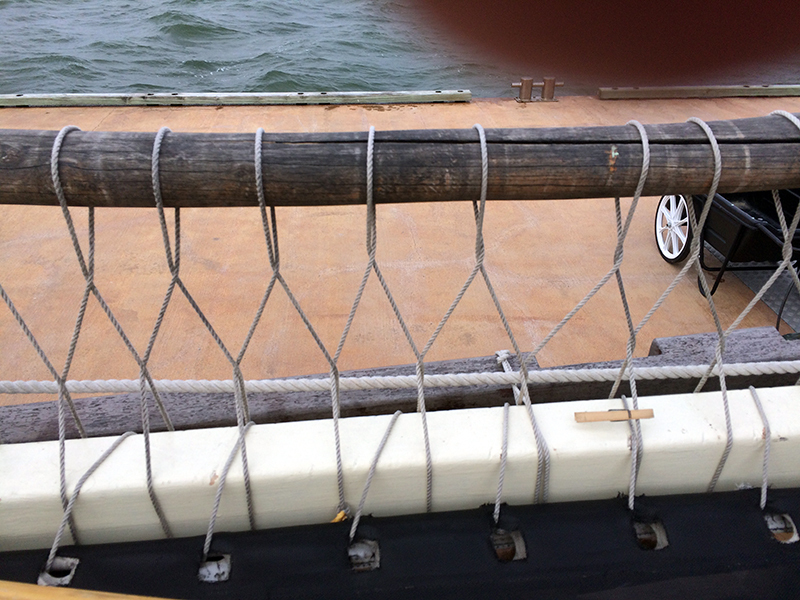 This is where the navigator sits—one side or the other, depending which way the sails are billowing out. Before I could move on to making these platforms, it was clear I had to make the catwalks that sit on the outside ends of the iako. I had been debating whether or not to add these. 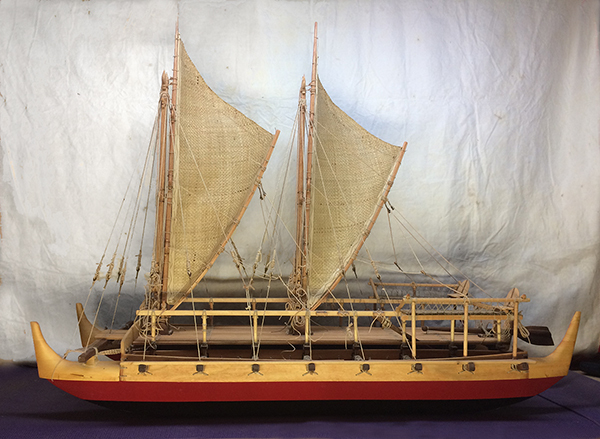 I almost never saw them on other models of Hokulea, and wasn't sure whether they would add or detract. But now the decision was pretty much forced on me by the circumstances. I took a thin popular board and did my best to trace the shape off the side of the deck-hull, then cut it out and ripped it down to the right width so that the ends of the iako would still be visible. It took some shaping to get a tight fit. 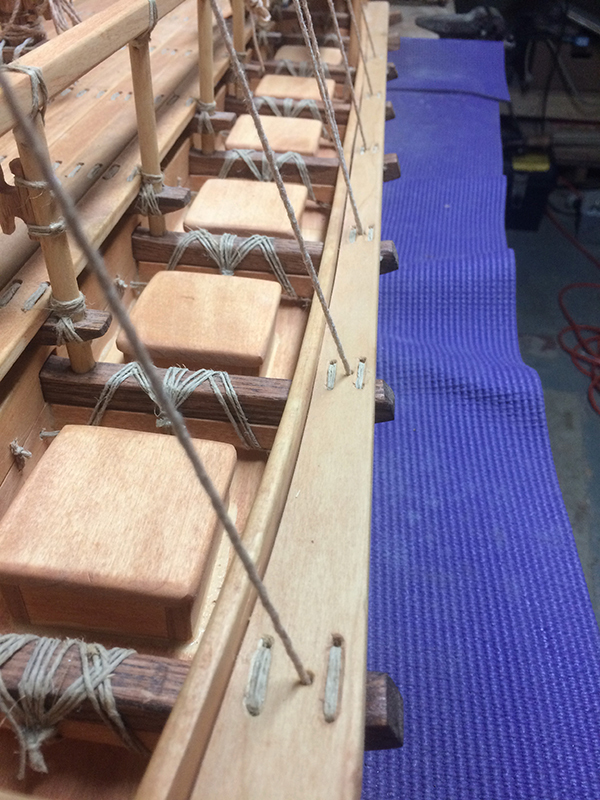 Then, as with the pola, I drilled holes and carved countersink grooves for the lashing, and then put these on. 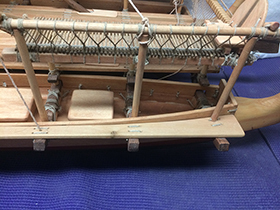 Catwalk mounted on the port-side iako. Catwalk at the stern, where the navigator platform is. 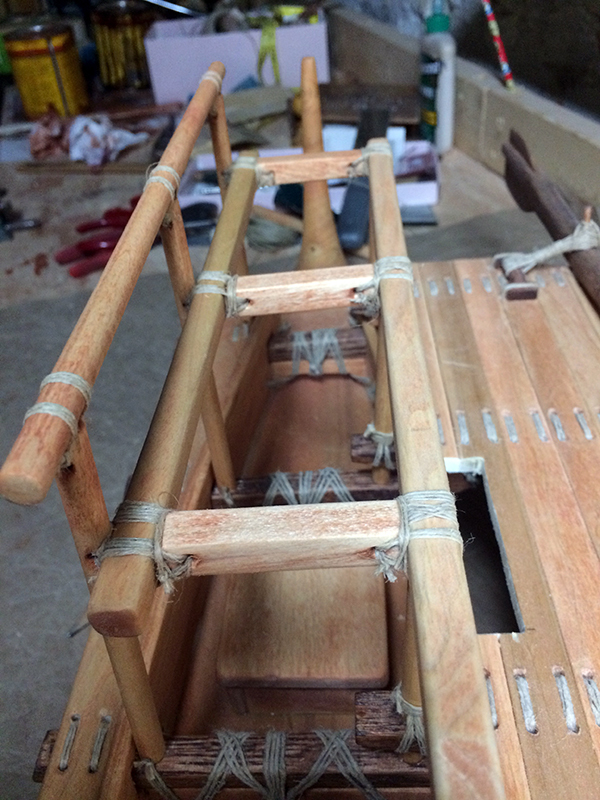 I decided they looked good, and really transformed the work-in-progress into something more resembling a voyaging canoe. These catwalks are used for getting around the sleeping quarters, created by canvas tenting over the rails and hull decks. 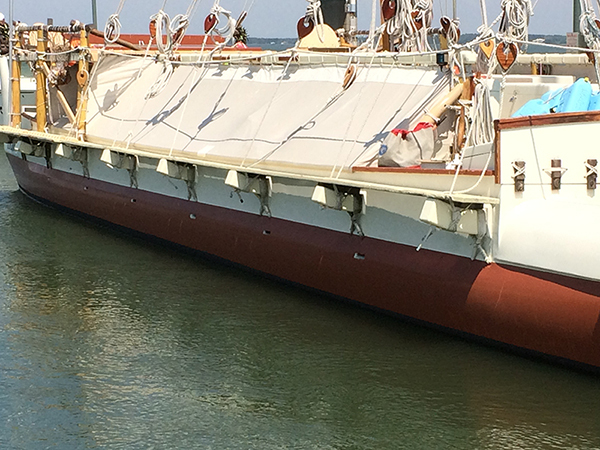 As I explained here, the crew sleep atop plywood sheets over the hatches, with a foam pad on top of that. You have to move all of that to open the hatch and retrieve supplies. 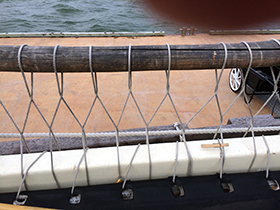 Anyway, the catwalk is used for attending to rigging, hanging bumpers when docking, and even going to the bathroom. 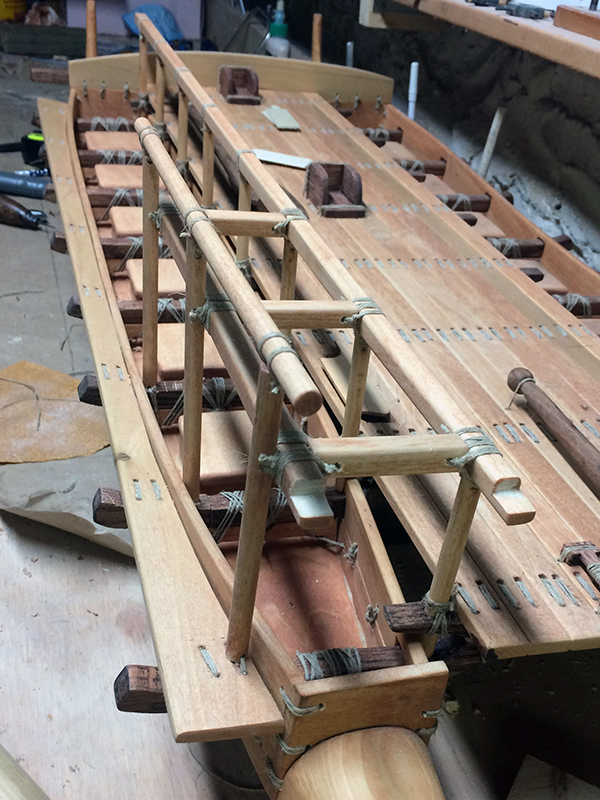 Constructing the navigator platforms was pretty straightforward: the rail served as one side of it, then it was a simple matter of cutting, shaping and fitting the rest of the framework. I particularly enjoyed lashing the little pieces neatly. Two views of the first navigator platform frame. You can see that the rail on the other side has not been made yet. Making these platforms was simultaneous with making the rails. It all had to happen at once. Now I was faced with a dilemma: what to make the surface of these platforms out of? On Hokulea, they are some sort of rubberized mesh, and are referred to as the "trampolines." I didn't have a substitute for that, and wanted a more traditional look anyway. 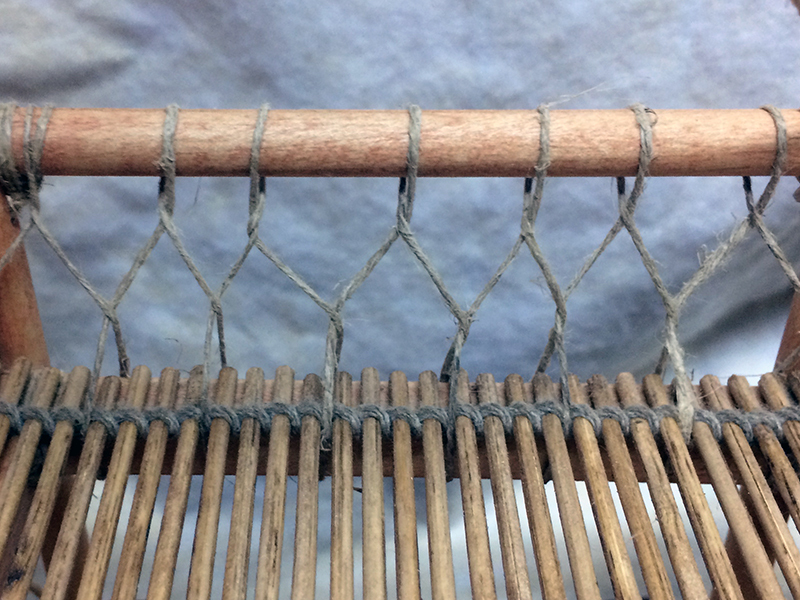 I thought about using lauhala matting, but decided that would not have been used traditionally since it's not strong enough. 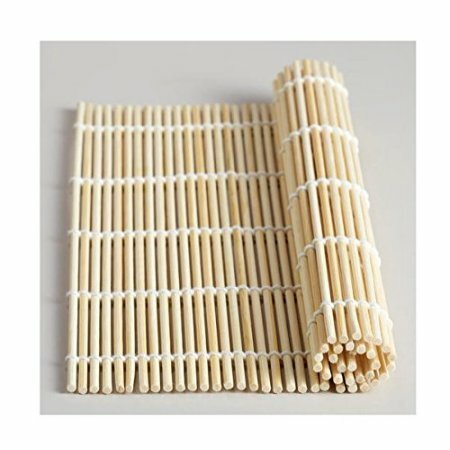 Then I thought about bamboo, which I use for the set-outs on my sailing canoe. Lash a bunch of them in a row and there you go! I realized that I had a bunch of bamboo kabob skewers in the kitchen, and thought of lashing them together. Just as I was imagining what a chore that might be, I realized I already had almost exactly that, already made: sushi-rolling mats. What's more, it was exactly the right length! I just needed to cut a width I could use, making sure it was stitched on both sides. This proved more difficult than I expected. I thought I could just run it over a saw. 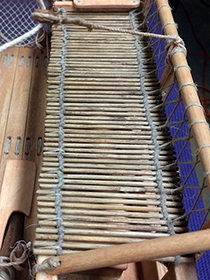 But the individual bamboo pieces moved around, making for irregular cuts. 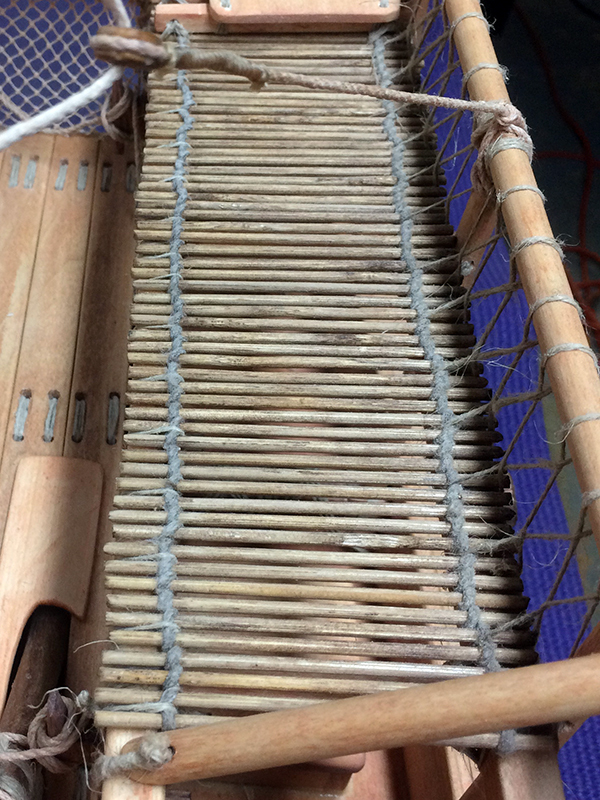 So I ended up snipping each one individually to just the right length, then slid the stitching to where I wanted it. Then I dyed these pieces and lashed them on. 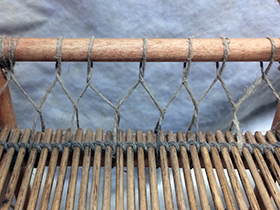 The bamboo matting, lashed to the frame of the navigator platform. The next task was to make the navigator's seat. I had looked carefully at my pictures of Hokulea to do this. 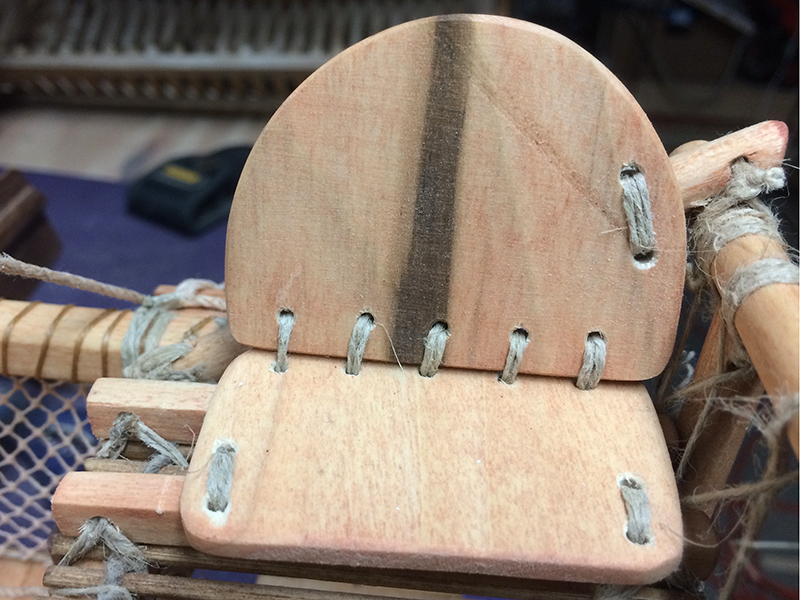 The milled lumber I had was not thin enough for this, so I took two nice pieces of poplar, one with a dark grain stripe in the middle, and oh-so-carefully sliced them each into two thin wafers using my band saw. One was so thin it broke and I had to do it again. Then I shaped this as the picture shows, stitched them together into seats, and carefully lashed them into place. Finally (though technically I did this before attaching the seats) there was the matter of that pretty rope work that made the outside "fence" for the platform. It took a little figuring out to learn how it was done, but in the end, it came out just fine. 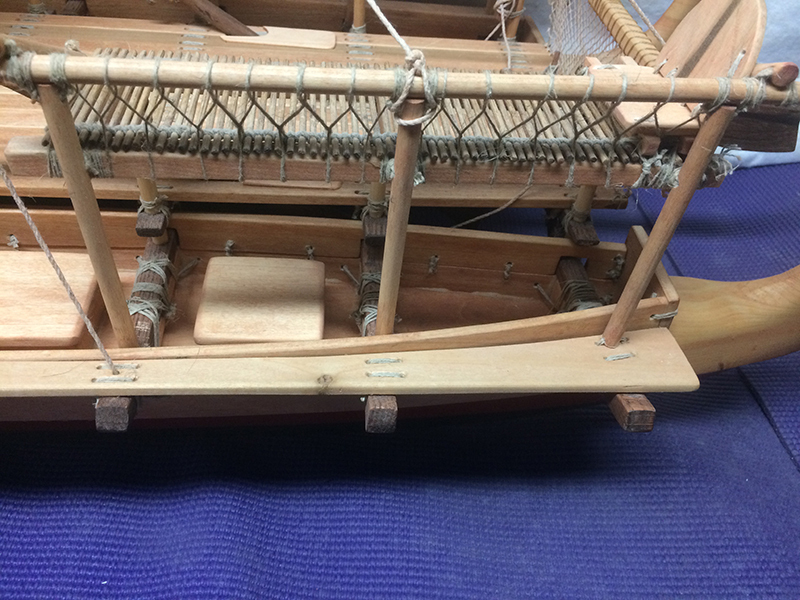 Now as I prepare to tackle the sails and rigging, there are a lot of small pieces I need to make.